You don't have to wait until ski season to fall in love with Windham. We're already obsessed with the beers and milkshakes at Cave Mountain Brewing Co., the crumb cake and cookies at Higher Grounds Coffee, and the luncheonette/toy shop/enchanted forest at the Catskill Mountain Country Store. And now whenever we visit, we'll have to finish our days at the Mill Rock over big plates of simple, hearty Italian fare. We dined at the Mill Rock with a group of 9 to celebrate my parents' anniversary. The warm atmosphere and the staff's friendliness made all of us, including the 3 little grandchildren, feel at home. I ordered the delicious and generously portioned penne with smoked salmon and wild mushrooms in a light cream sauce. It was the perfect earthy, savory dish to welcome fall. Archer went for the penne with butter. 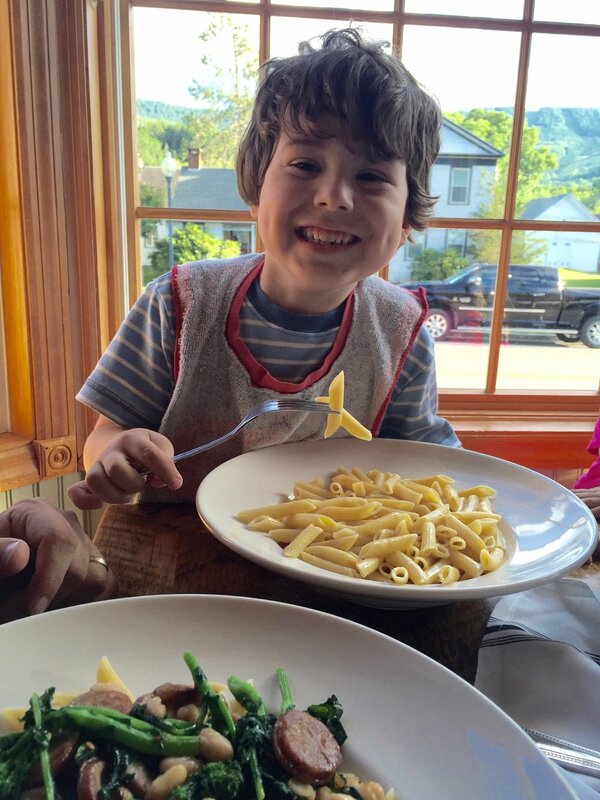 He's a pasta monster who usually polishes off a kid-sized plate in a minute, but the Mill Rock's giant pasta bowls did him in. I love that post-pasta face! In the lower left-hand corner, you can see Pete's penne plate, which paired rich sausage with garlicky broccoli rabe. The family at the table beside us was eating some delicious-looking pizzas, fresh out of the Mill Rock's wood-burning oven. We'll definitely come back to try those. After dinner, Archer cuddled with his little sister and cousin and looked out the front window to Windham's Main Street, which is home to the most beautiful sidewalk flower gardens I've ever seen. After seeing that explosion of color, I'll never again be satisfied by a strip of grass between the sidewalk and the street! So beautiful. We've got more Windham trips planned for the fall and winter. Where should we go next?